Evermotion HDRI - Hub vol. 4 is a collection Which contains 17 high resolution HDR maps (up to 10k px). Each HDR location contains the sIBL set and the corresponding high resolution source HDR file. sIBL is a short name for Smart Image Based Lighting. 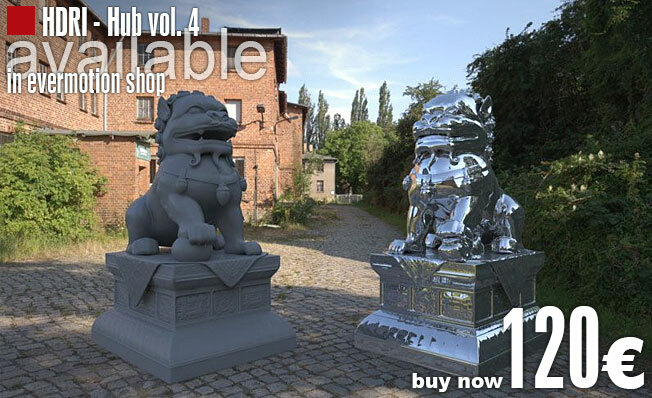 In short it is a toolset for organizing your hdri environments and is a single click preset solution to setup your scene with photo realistic lighting. It works with most major 3D programs like Lightwave, 3ds MAX, Maya, Modo and XSI.